Today, in the mining industry, safety standards are more stringent than ever. Should a mine experience an incident, which results in an injury or even a fatality, the subsequent legal consequences and financial penalties can be severe. A potential risk in open-pit mines concerns the ultra-large tyres on off-the-road (OTR) vehicles. Over the past couple of decades, there have been recorded instances of these tyres catching fire and, in some cases, actually exploding – with potentially serious consequences. However, nitrogen tyre inflation has proven to be very effective at preventing tyre fires and explosions. NitraLife, a company established in 1996, which has been at the forefront of nitrogen tyre inflation technology, was the first internationally to use a membrane separation process to generate high-purity nitrogen for commercial tyre inflation and subsequently also in large off-the-road (OTR) mine vehicle tyres. In an extension of this overheating scenario, on certain mines, nitrogen tyre inflation has been used to protect tyres against lightning strikes. The power of lightning is such that it will earth through the tyre to ground, and has in the past been the cause of tyre fires. There have instances of mines parking their vehicles with air-inflated tyres in safe areas during lightning storms – an expensive exercise when one considers the cost of downtime. “To date, we are not aware of an instance of tyre combustion at any mine using our nitrogen tyre inflation systems,” comments Sowry. Cost is also another good reason why the mining sector has increasingly adopted nitrogen tyre inflation. Nitrogen permeates through tyre walls approximately four times more slowly than oxygen, and 117 times more slowly than water vapour. Under the sometimes very harsh conditions under which OTR tyres operate, nitrogen inflation ensures that tyre pressures remain optimal for longer. “Tyres at the correct pressure flex less, and are less likely to overheat, a factor that is a major cause of premature tyre failures. Based on many years’ experience and customer feedback, we conservatively estimate that nitrogen tyre inflation extends OTR tyre life by at least 10%,” Sowry points out. “Oxygen and water vapour degrade rubber gradually weakening tyre casings. By removing those elements, tyres last longer, particularly if they are being used in harsh climatic regions where heat and moisture are prevalent,” he continues. He adds that oxygen and water vapour also rust the steel rims of OTR vehicles, as tyre beads do not seat well on rust-pitted rims, which leads to consistent pressure loss and the risk of tyres running under-inflated. Furthermore, for most of their operational time, haul trucks drive on the steep gradients of unsurfaced pit ramps, which places tyres under even greater stress. In these testing conditions, correct tyre inflation is more important than ever. 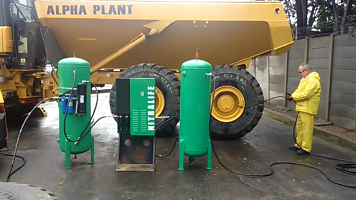 On remote mines, NitraLife nitrogen generators offer a trouble-free solution to removing oxygen and water vapour from inside tyres. “The generator is completely pneumatic – requiring no electricity – has no moving parts and is fed air by a conventional compressor, requiring minimal maintenance. We also customise our membrane generators to suit a mine’s specific requirements, and can supply both large and small mining companies, through either a rental or purchase option. Additionally, the portable nitrogen trailer – another innovation we have developed – is perfect for mines in remote sites requiring a mobile nitrogen solution,” Sowry enthuses. As an option with a generator, NitraLife offers digital automatic tyre inflation. Manual analogue gauges tend to drift out of calibration as the moving parts inside them age. With automatic digital tyre inflation, the correct tyre pressure is entered into the control panel. The digital inflator monitors then pressure during inflation, automatically shutting the generator off when the pressure is correct. In South Africa, most mining companies recognise the value of nitrogen tyre inflation. “At present, almost all large mining houses in this country have nitrogen inflation as a technical standard,” says Sowry. A recent development is that NitraLife’s customers are becoming increasingly well-educated and discerning about nitrogen tyre inflation. When the company began supplying generators to mines, the commonly-accepted standard was 95% purity. However, Sowry has had requests from two major mining companies which now require the additional assurance of 97% and 98% nitrogen purity levels respectively. “Of course, we have been delighted to oblige in these instances, and that our valued customer base is becoming more discerning and knowledgeable about their nitrogen filling specifications and requirements, we are very pleased to supply,” he adds. Asked about supplying generators to mines outside South Africa, Sowry is emphatic: “Sure – we have already supplied to generators into mines in Zambia and the DRC; as well as mines in Asia, and the Americas. We like to have our technicians install and maintain whatever we sell, but where this is not practical from a logistical or cost perspective, our generators are very user-friendly to install and commission,” says Sowry. “Large mining tyres are hugely expensive and sometimes the lead times to delivery are long. In terms of what we supply, NitraLife, through our nitrogen tyre inflation systems, continues to make an invaluable contribution to increasingly profitable operation of open-pit mines the world over,” Sowry concludes. Previous: “Refueling” of electric vehicles in “no time”. Powerswap reveals news of their radical solution for charging electric vehicles.